Cornwall-on-Hudson street, New York, U.S.
David Howell Petraeus (pronunciation: /pɨˈtreɪ.əs/; born November 7, 1952) was the Director of the Central Intelligence Agency. He was sworn in on September 6, 2011. 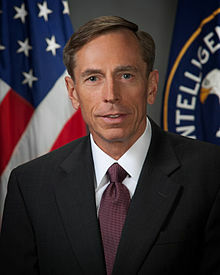 Prior to his assuming the directorship of the CIA, Petraeus was a four-star general serving over 37 years in the United States Army. On November 9, 2012, Petraeus resigned as CIA director following a marital scandal. ↑ Dana Ford (November 10, 2012). "CIA chief Petraeus resigns over affair". CNN. Retrieved November 26, 2012. This page was last changed on 12 March 2013, at 19:57.